When McDonald’s and other fast-food chains announced last month that the infamous “pink slime” was no longer being used in their burgers, some thought the ammonium hydroxide-treated beef cuts had disappeared from our food supply once and for all. Raw beef. (Jahi Chikwendiu – WASHINGTON POST) But a new report in the Daily tablet newspaper suggests the slime will appear in school lunches this spring (2012) — 7 million pounds of it. The USDA, schools and school districts plan to buy the treated beef from Beef Products Inc. (BPI) for the national school-lunch program in coming months. 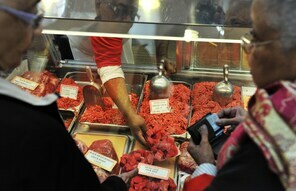 USDA said in a statement that all of its ground beef purchases “meet the highest standard for food safety.” The department also said it had strengthened ground beef safety standards in recent years. Last April, celebrity chef Jamie Oliver reported that 70 percent of America’s ground beef is made with BPI’s ammonia-treated product. What the heck does, “generously recognized as safe” mean? And what happens when, on one of those days, or during one of those moments, it isn’t safe? Here’s the link to the rest of Ms. Flock’s article.